....The big debut! Yes here it is, my new favourite roll-neck jumper....from Topman. 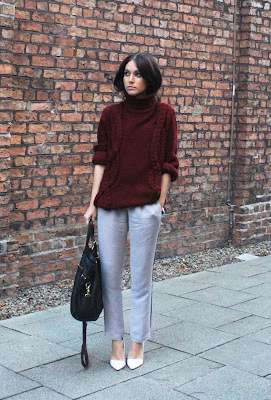 Knitwear is having a moment, especially roll necks, with one magazine stating recently that retailers have reported a huge increase in sales of them this year! I am not even slightly suprised...functional, stylish and so bloody warm, they are a godsend when temperatures plummet. This Topman version is perfect, a deep deep shade of maroon with a statement cable knit design. I bought the trousers i paired it with back in the summer from Zara. They are so comfortable (my boyfriend thinks they look like pyjamas) and are versatile enough to wear with pretty much anything in my wardrobe. Tomorrow will see the launch of Versace for H&M, my guess is that it is going to be sold out and pretty quick for that matter! I wont be making any purchases from it or camping out outside a store...but will you?